Biometrics refers to the automated recognition of individuals based on their biological and behavioral characteristics. Due to the strong link between subjects and their biometric samples, the wide acceptance, and their user convenience, biometric systems become increasingly popular and important for border control. To prevent the aforementioned face morphing attacks, an automatic detection of morphs is required at border control as well as early in the application process. This must be considered as the most challenging research task to date and long-term research will be need to fully address the challenge. However on this page reports recent progress in this research area. Focusing on the workflow of a generic biometric system, two Morphing Attack Detection (MAD) tasks can be distinguished: (1) detection during enrolment, e.g. the passport application process, where the MAD mechanism processes a single image, referred to as no-reference morphing attack detection and depicted in Figure (a); and (2) detection at the time of authentication, e.g. the usage of Automated Border Control (ABC) gates at borders, where a live capture from an authentication attempt serves as additional source of information for the MAD mechanism, referred to as differential morphing detection and depicted in Figure (b). The feasibility of such morphing attacks was first shown for face recognition systems in 2014 in the FIDELITY project by M. Ferrara, A. Franco and D. Maltoni in her IJCB paper "The magic passport". With our research we address the problem of morphing attacks. The work has started only recently. 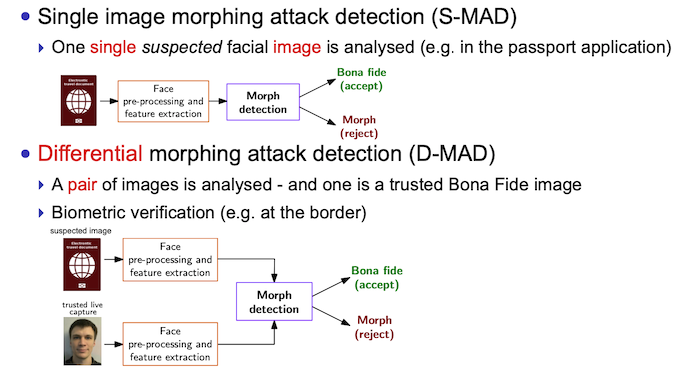 In 2016 the first Morphing Attack Detection (MAD) mechanism was proposed by R. Raghavendra, K. Raja and C. Busch in the BTAS paper "Detecting Morphed Facial Images". Since we have started numerous efforts to address this research challenge.